Life is difficult and life is painful. Contrary to popular belief, God never promised that life would be pain-free. He does, however, promise to be present in the midst of the pain. If we believe that, I mean really believe it, it gives comfort and hope. Sarah and Abraham were unquestionably hurting over their childlessness—a heartache felt by many today, too. I’m sure that decade after decade, Abraham had hope, only to have his dreams crushed again and again. God does not promise offspring to all of us, but He did promise them to Abraham. Would Abraham be willing to risk the pain and hope again? Belief is comfort in the midst of pain. Lord, You told us that we would have difficulty and pain in this life. I believe that. You also promised that You would bring comfort and peace in it. I believe that, too. Where I have lost hope, I ask that You would give me the faith to live according to Your promises. Amen. We want to help you spend more time with God in 2012, and grow to know Him more personally and intimately. 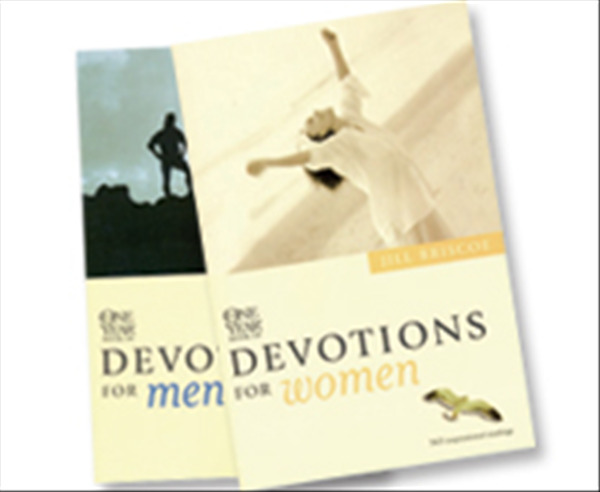 That’s why we want to send you either The One Year Book of Devotions for Women by Jill Briscoeor The One Year Book of Devotions for Men by Stuart Briscoe. Choose either devotional book as our gift to thank you for your online donation to help Telling the Truth launch into a new year of ministry to you and others!